I flew in on St. Patrick's Day; Jonathan took the same flight the following night. Not a whole of exciting stuff went on while we were in Florida, since there was a lot of administrative stuff to do, like dentist appointments, tax filing, and Jonathan taking his comprehensive examinations. But, there were a few out-of-the-ordinary events that took place, so here's the lowdown on them. Saturday afternoon, I played in a dodgeball tournament. My brother had a team for the Buzz 103.1's annual contest, and he needed another female for his team to be legal, and I somehow got roped in, LoL. But, half of the team (at times) was my brother, sister, and I... so you know this was gonna be somewhat entertaining. I should mention that dodgeball is not my sport (LoL, I've already mentioned that I'm not good at running or at playing basketball, either. don't worry, I'm sure I'll talk about my softball days soon enough...). 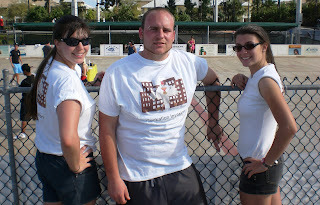 I did play on an intramural team my final semester of college. It was something that my residents put together, and I would have done anything for those girls. But, we managed to score a grand total of one point, ever. 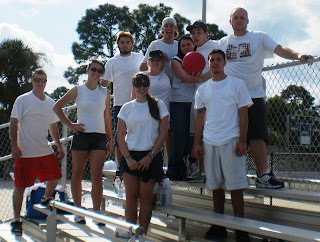 In all of the games/matches we ever took part in, we lost miserably, LoL. Therefore, I was kinda paranoid that I'd be horrible and bring down my brother's team. However, that wasn't the case. In fact, our team was quite good. We won 3 of our 4 qualifying games, and the first of our two bracket games. Interestingly, both games we lost were to the same team, and that team went on to win second place overall... so although technically we were in a four-way-tie for 8th (unless you count qualifying round wins, but we're not), I think we were a bit better than that. Most of us agree that if our second bracket game was against a different team, we would probably have gotten to about 3rd place. And that's much better than how the team did last year, so good for everyone. It certainly helped that we had a couple of great catchers, and that (for some strange reason) Kyla and I were hardly ever targeted (it seemed like most other teams normally had the girls out first). After the game, we went to the after-party at a dive called Average Joe's, but it was, um, a dive, LoL. So, we left and went to Cheeseburgers & More, since a couple of the guys had been there and agreed the burgers were good. It wasn't the greatest place ever, and I certainly wasn't as impressed as some (neither was Kyla for that matter), but they did have some great onion rings. I also got out of there for $10 with tip, so not bad in that perspective. Another fun thing was a meal that we ate at Jonathan's parents' house. His mom used an Australian recipe for soup, and it was absolutely the stand-out dish to dinner. Very basic in creation (cabbage, potatoes, sausage), this tomato-based soup (that actually sounds rather Irish, LoL) turned out to be pretty good. And when paired with other light items like garlic cocktail shrimp and ham/turkey sandwiches, the meal came together excellently, especially considering we sat down shortly after 8pm. We also had yellow rice, which is a personal favorite (Jonathan loves it, too), so that was a great crowning touch. On the very first day of ninth grade, I had lunch with two of my best friends and a new kid (and new kids were rare, since almost everyone stayed at our school from grades 6-12). Alan (the new kid) became a very good friend of mine throughout high school (we had 4-6 classes together each year), and we've kept in touch through the years. I went to his wedding (Jonathan was video-ing another wedding that day) in Tennessee/Georgia (it was on Lookout Mountain, and I kept crossing state lines as I drove up it, so I don't remember which state I ended up in, LoL), and since then he moved to Nebraska, and now Georgia. BUT, it turned out that he was in Orlando the week we were, so we got together to have dinner there (it was also his birthday, but that was just a coincidence, LoL).